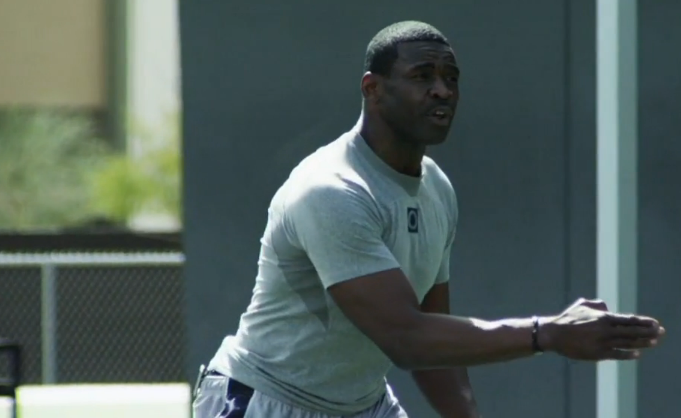 Hall of Famer Michael Irvin coaches up wide receivers A.J. Green and Greg Little in a 2011 episode of Game Changers. DLP is excited to announce the return of Game Changers, an NFL Network series featuring top talent preparing to make the jump to the pros. Steve Mariucci and other NFL legends like Marshall Faulk, Michael Irvin, Kurt Warner, and Warren Sapp will work out with the top college prospects as they prepare for the 2013 NFL Draft. In addition to physical training and position drills, our veterans will run the rookies through the mental preparation it takes to succeed on the next level. Physical production will be in Los Angeles in early March and episodes will begin rolling out in late March and early April to build anticipation for for the NFL Draft being held April 25-27. A couple of years ago before the 2011 NFL Draft, DLP went to Athlete’s Performance in Phoenix to see how Coach Steve Mariucci sized up the 2011 draft class for an earlier season of Game Changers. Coach Mariucci sat down by position with some of the nation’s most touted quarterbacks, receivers, defensive lineman, and defensive backs before testing their skills on the field and eventually critiquing them in the film room. NFL greats Michael Irvin, Warren Sapp, and Willie McGinest helped work these guys out for Coach Mariucci and the cameras. Of the nine athletes featured in the 2011 edition of Game Changers six were first round draft picks, two were second round picks, and our only undrafted player can brag that he’s beat cancer and won a Super Bowl. Now that our group of game changers have mostly wrapped up their sophomore campaigns in the NFL we thought it’d be fun to take a look at where they are now. Marcell edged out AJ Green (#4 overall) as the earliest selection of our game changers when Buffalo picked the Alabama man and Defensive MVP of the 2010 BCS National Championship Game with the third overall pick. Dareus signed a four year deal worth $20.4 million before starting all 16 games of his rookie season and setting a Bills rookie sack record despite playing through injuries to his shoulder and hand. Tragically in September of his sophomore season Marcell’s younger brother was fatally shot. The team allowed the second year player to excuse himself from team obligations to cope with the family tragedy. AJ is an athlete and a game changer. He’s been the top offensive weapon for the Cincinnati Bengals since joining the league. His first NFL catch was a 41-yard touchdown against instate rival the Cleveland Browns. Green became the first rookie WR since Anquan Boldin in 2003 to make the Pro Bowl. The last Bengals rookie wide receiver to make the Pro Bowl was Cris Collinsworth in 1981. AJ’s impressive numbers helped the Bengals reach the playoffs in each of his first two seasons. Despite first round playoff exits, if the Bengals keep drafting game changers like AJ Green the sky’s the limit. Aldon Smith has been a legitimate game changer for the San Francisco 49ers. Smith’s arrival coincides with Head Coach Jim Harbaugh joining the team and the 49ers becoming Super Bowl contenders. To understand the impact Aldon’s made all you have to know is that he’s broken records once held by Reggie White (fastest player to 30 career sacks and most sacks in first two seasons). Aldon Smith co-anchors a stout 49ers defensive line along with another Mizzou grad who shares his surname, NFL veteran Justin Smith. Aldon’s contributions play a role in the 49ers being the Vegas favorites in Super Bowl XLVII. In July, 2011 after going to Jacksonville with the #10 overall pick, the former Missouri Tiger signed a deal worth $12 million over four years. Although Gabbert had an opportunity to get on the field as a starter early in his rookie year he hasn’t been able to capitalize on it. His statistics and his team’s record are among the worst in the league over the two years he’s been with the Jaguars. A lot of people were surprised when this Florida State Seminole was taken so early in the draft, but the Vikings needed a QB and wanted to get Ponder into their backfield with Adrian Peterson. Halfway through his rookie campaign Ponder got his first start on Sunday, October 23 against the Green Bay Packers. The then unbeaten Packers handed Ponder a 33-27 loss in his first start, but the young signal caller showed some encouraging playmaking abilities. The following week Ponder got his first win in a game against fellow rookie QB Cam Newton and the Carolina Panthers. During Ponder’s second year in the league he put up lackluster stats while the offense was largely carried by comeback player of the year frontrunner Adrian Peterson. Disgruntled Vikings fans have pointed to the timing of Ponder’s relationship with ESPN reporter Samantha Steele as coinciding with Christian’s decline. Ponder and Steele married in December, 2012, just a few weeks before Ponder was inactive (elbow) for the Vikings first round playoff loss to the Packers. A day after signing with the Giants Prince was sidelined with a broken left foot. Prince bounced back and made the most of his first opportunity on the field in the NFL. During his first series he intercepted a Vince Young pass against the Eagles. He went on to win his first Super Bowl when the Giants defeated the Patriots 21-17 in early 2012. Of all of our game changers Aaron’s probably had the most nondescript first couple of years in the league. During his rookie season with the Bills Aaron did record his first NFL interception. His sophomore campaign is shaping up to post around the same number of tackles as his rookie season, about 30. Although Aaron has been a starter and consistent contributor, the Bills surely have even higher hopes for a player who was once ranked the top high school safety in the country. At 6’2” 231 pounds Little’s a speedy WR (4.53 40 yard dash) with LB size and strength. Greg finished the 2011 season leading the Cleveland Browns in catches and receiving yards. He was second amongst rookies in catches (behind AJ Green) and fifth in yardage. Little struggled with dropped passes in 2012. In 2008 Mark was an All-American and the ACC Defensive Player of the Year. He was projected as a top-15 NFL Draft pick before opting to return to Boston College for another season. Tragically, Mark missed the entire 2009 season because of a rare form of bone cancer. After persevering through challenging treatment he miraculously returned to the field in 2010 where he once again garnered awards and helped his team win games. Despite going undrafted in the 2011 NFL Draft, Mark found his way onto a roster in July, 2011 once the NFL lockout ended. On July 26, 2011, Herzlich signed as an undrafted free agent with the New York Giants. He made the final 53 man roster and on November 20, 2011, Herzlich made his first NFL start against the Eagles. A couple of months later he was part of the Super Bowl XLVI Champion Giants.